As a modern parent one of the biggest fears faced by our generation is not being able to protect our children from the very real dangers they can encounter via the internet. As well as teaching then to look before crossing the road and not to accept real sweets from real strangers, we have to help them understand how to keep themselves safe online. 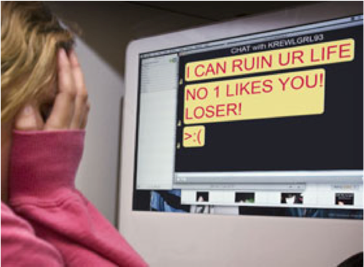 Cyber bullying is a grim reality that children and teenagers face in modern society. Technically a minor must commit the act, as anyone over the age of 18 who engages in these acts is considered guilty of cyber stalking or cyber-harassment. It is usually perpetuated against other minors, and victim and bully often exchange roles. Cyber bullying, very simply defined, is bullying that takes place on electronic technology. This means any bullying that is done using a computer, smartphone or tablet on social media sites, websites, email or other digital platforms. It can involve posting upsetting messages to victims’ social media accounts, or publicly defaming them. Cyber bullying is even being seen in the worldof eSports with increasing regularity. The frequency with which cyber bullying occurs is both disturbing and alarming. Because it can be done anonymously, it seems that it is far more common than bullying that is committed in the physical, offline world. And while it’s true that many children and teens that are cyber bullied are bullied in other ways too, it is also true that many of them are only targeted online. Recent research has found that girls are roughly twice as likely as boys to be both the victims and the perpetrators involved in cyber bullying incidents. Roughly 75% of teens surveyed for some studies admitted to visiting a website aimed at bashing a fellow student in some way, while around 58% said that someone had said mean things to them online. Of that number, 4 out of 10 said it had happened more than once. Perhaps most frighteningly, while about 68% say that cyber bullying is a serious problem and around 81% consider it easier and more common than offline bullying, 90% of teens who have seen cyber bullying on social media report that they have ignored it. The anonymous culture of fear seems to be easily spread; when someone becomes a victim and is ridiculed online, it is very easy for other young people to get involved or to turn a blind eye and be grateful that they are not the victims this time. Children and teens who are cyber bullied are more likely to miss school, have lower grades, suffer low self-esteem, struggle with poor health, abuse alcohol or drugs, engage in self-harm and engage in other forms of risk-taking behaviour. Victims have also been found to be between 2 and 9 times more likely to contemplate suicide. With the victims of cyber bullying often perpetrating the cycle themselves, it has started to permeate the structure of school culture too. Mistrust, depression, spite, anger and aggression in learners can all be the result of a general malaise of cyber bullying. And once something has been posted online, it is often almost impossible to completely remove from the Internet. What Can Be Done To Prevent Cyber Bullying? There are steps that schools can take to institute no bullying - cyber or otherwise- policies among their students. But since the activities are anonymous, are often very difficult to trace, and so easy to repeat, it is also important to deal with the causes of the bullying as well as the effects. The effects of cyber bullying, and the reason young people are driven to act like this in the first place, should be brought out into the open and discussed. Often teens are feeling pressured or depressed, and need help in developing skills to cope with life instead of resorting to these cyber attacks. Parents and educators should work on fostering environments of respect and trust, so that cyber bullying is less likely to occur in the first place and so that when it does, victims are more likely to confide in them. Unfortunately, with the increase in social media platform popularity, social gaming and other online interactions, cyber bullying is not set to stop anytime soon, so knowing how to prevent or act on it is crucial.